I constantly remind myself of this because it is the most important concept in regards to painting. Why? Why merely practice? Why not create finished masterpieces? It’s all about the mindset as I paint. The other day I found myself afraid to change a bit of a painting I was working on … (okay, it was the portrait of my cat … my cat painting, for crying out loud). Gazing at the painting, I thought perhaps the foreleg that stretched forward could use some lighter highlights on the tufts of fur. But the fur looked okay the way it was. Decision time: on the one hand, why mess with it? On the other hand, adding the highlights could make it really pop. On the other other hand, screwing with it could create a mess. And that would just ruin EVERYTHING and I’ll get in a bad mood and .. you know what? Just screw this whole thing. I’m not painting anymore. Do you see where I’m going with this? When I find myself getting anxious with such silliness (which happens more frequently than I care to admit), I remind myself to just go for it. And the reason I go for it is because I know this is just practice. Life, and everything in it, is not that serious. This cat painting? Its just an experience in my learning to paint. Its an experience to help me understand the medium more, and the cat too. And if I don’t try things, I won’t learn. And then I won’t grow and get better. One of my favorite teachers of all time once said to me (as I was happily gazing at a completed and somewhat successful painting), “Great. Now just do that 10,000 more times.“ I repeat that to myself all the time. Do it over and over. Making art is more than this one painting – it’s a long winding road of development. I just love that. Such an approach helps me not only in painting, but really just about any situation in life. If you don’t try something, on a canvas or in the world at large, you’ll never know how it will turn out. Maybe it will turn out like crap. But that just informs you for the next time you try it. And you just keep growing and getting better each time you do it… each time you practice. Practice is sacred and beautiful. 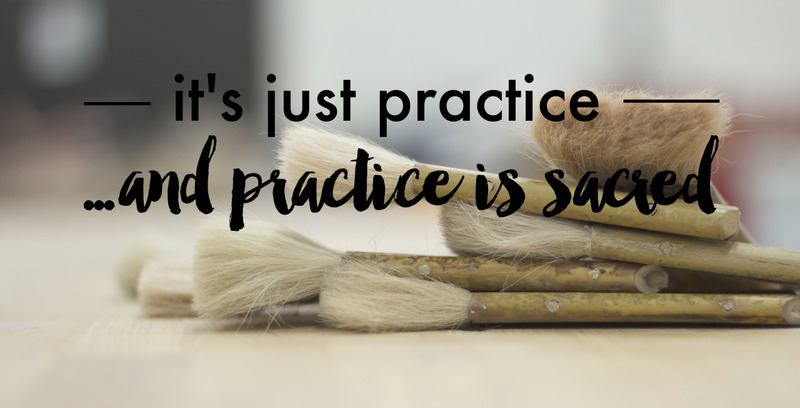 Practice is being present in the moment – with paint or without.